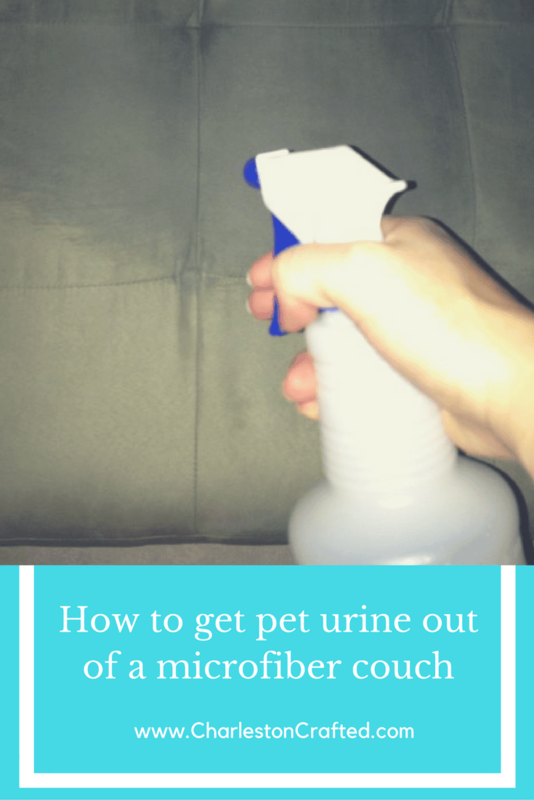 Looking to get pet urine smells out of your couch? You are in the right place! If you are looking for more great pet ideas (we have a cat and a dog!) check out all of our pet projects here and also please check out our About page! Want a free pet mess clean up checklist directly in your inbox? Sign up here! I have a problem. I love my little kitty cat; he is the fluffiest, snuggliest little baby I know, but he has decided that my couch cushion is his litterbox. Any time I leave him alone, he pees on the cushion. It’s weird because he very rarely does it anywhere else! I’m working on getting him to stop- I’ve used pheremores, I lock him up while I’m gone during the day- but if you have any other suggestions, please let me know. I have taken him to the vet and they said nothing is wrong with him- it is just behavioral. Lucky me. I’m really sad because I feel like my couch is being ruined. 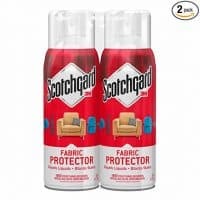 So, I combed the internet for cleaning techniques to deodorize the sofa. My couch is microfiber and from Ashley Furniture. I desperately want a new couch, but am afraid that he will ruin it immediately. As soon as you discover the “accident,” use paper towels to soak up as much as possible. Luckily, Cesar usually doesn’t go very much- another clue to me that this is just behavioral. As soon as possible, fully saturate the area with an enzyme cleaner. I like Nature’s Miracle. Follow the directions on the bottle, but some say to use a white rag to soak up the moisture after 5-10 minutes. If you want to do a deep cleaning, take the cushion covers off of the couch & run them through the washer with 1 cup of vinegar. Unfortunately my cushion covers are sewn to the foam cushion. You can’t take them off without ruining the couch. Take the cushions off of the sofa. I set mine on my screened porch. 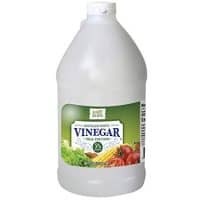 Spray with a mixture of 1/2 white vinegar, 1/2 warm water. I sprayed until they were very wet all over. 5. Then, sprinkle the entire cushion with baking soda. 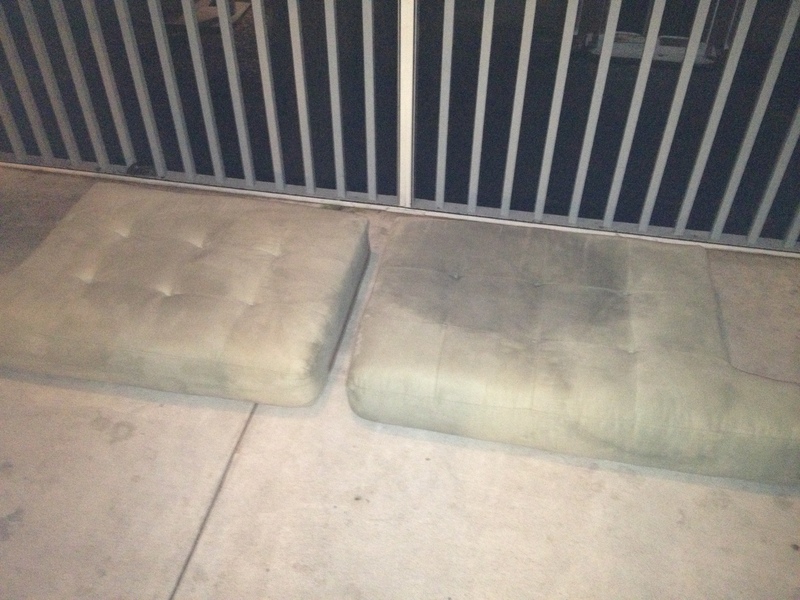 I sprinkled heavily, using a whole box on the 2 cushions. 6. Let sit for at least an hour- I left mine over night. 7. Vacuum well. I used the brush attachment and vacuumed slowly, twice in each direction (vertical & horizontal). Then I placed the cushions back on the couch. 9. Finally, I sprayed the whole thing heavily in Febreeze. 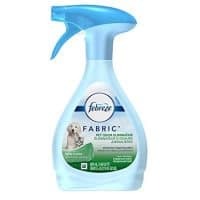 I like the super odor eliminating kind, especially for pet odors. That’s it! That’s how to get dog smell out of microfiber couch. My couch seriously smells and feels 10,000 times better! I am very happy with this system- it took a little time but was physically easy and used all ingredients I already had. Most importantly, it worked! 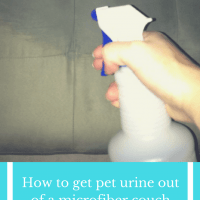 This is the best and easiest way to get pet urine smells out of a sofa or couch. 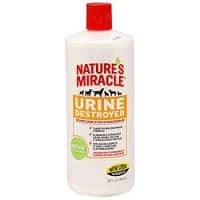 It works well on all furniture and carpet or rugs, too! Use paper towels to soak up as much of the moisture as possible. Fully saturate the area with an enzyme cleaner, following the directions on the bottle. If you have removable cushion covers - take the cushion covers off of the couch & run them through the washer with 1 cup of vinegar. 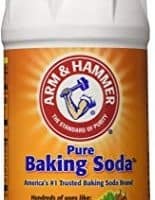 Sprinkle the entire cushion heavily with baking soda. Optional- apply scotch guard to help protect in the future. 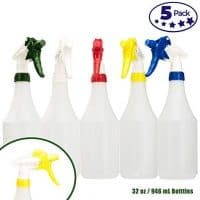 Spray with Febreeze or odor eliminator of choice. Do you have any tips for cleaning pet odors? What about for keeping them from being bad in the first place? **Edited to add: if you have further problems with deep pet stains (especially in carpets or upholstery), we love our Bissell spot clean stain remover. Check out the (unsolicited/not-sponsored/we genuinely bought and love it) review here! My sons cat peed on our micro fiber couch for the first time. I didnt notice it till the next day because of my work schedule. I sprayed it down with Natures Miracle waited then wiped it down and then sprayed it again. The thing is I can NOT remove my cushions. So any advice. It is right in the spot where my husband sits and he is very aggrivated that he can not sit there. Plus I smell it and its gross!! Please help!!!!!!!!! God Blesss! So smart! Thank you for the tip!